It takes quite a bit of stamina to get through this next month of festivities and feasting with friends and family. Spreading peace, love and joy? More like stress on the stomach, bank account and liver. It all starts with Thanksgiving, which interestingly enough is a holiday intended to provide an annual place holder for a moment of gratitude and peace in our ever busy lives. It always seems to quickly morph though into a stress-filled day of last minute grocery shopping, endless prepping, traffic-jam-traveling and forceful eating, followed by reluctant dishwashing. That theme is immediately carried over into Black Friday, the opening day of Christmas shopping for gifts intended for loved ones, which has now become overshadowed by ugliness and violence that gets more shocking every year. From what I’ve already seen on Facebook and Instagram today, no thank you. 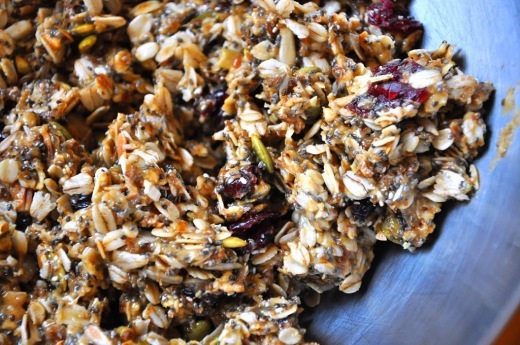 Before the holidays get into full swing (and I get too cynical), I’m extending Thanksgiving into the weekend, to relax and get caught up on life: shredding old papers, cleaning out a closet, organizing old photos, reading magazines and making granola bars. 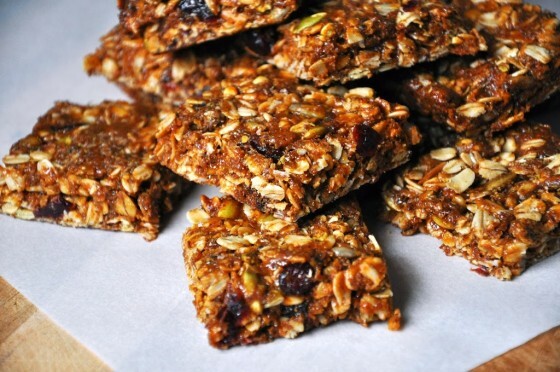 These granola bars aren’t diet food (sorry! ), they’re delicious. I could tout the health properties of omega-3’s in flax seeds, fiber-rich chia seeds, or protein-packed pumpkin seeds, but I won’t. I will say that they’re full of good ingredients to keep you satisfied and a chewy, sweet bite. Chock full of whatever nuts, seeds, fruit and any other odds and ends else lurking in the pantry, these bars are the type of thing I like to make when I know I’ve got a full week ahead. Or six. Like suggested below, swap out whatever ingredients for stuff you have on hand/prefer. No chia seeds? Use all flax. No nuts? Use all dried fruit. You can also skip the peanut butter completely, ain’t no thang. 65g (1/2 cup) dried, chopped fruit, such as cranberries, cherries, apricots, raisins, etc. 60g (1/2 cup) chopped nuts/seeds, such as walnuts, almonds, sunflower seeds, pumpkin seeds, etc. Toast the oats. 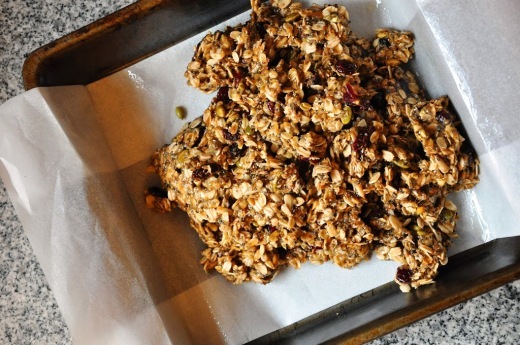 Preheat oven to 325⁰F and spread the oats evenly on a baking sheet. Toast the oats until like golden brown, about 15-18 minutes. 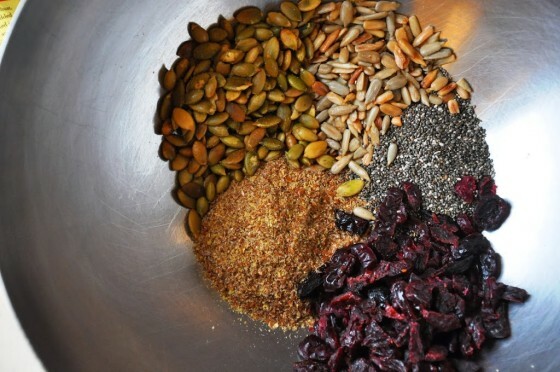 Pour into a large bowl along with the seeds, fruit and nuts; toss to combine. Line a 9×9-inch baking pan with parchment paper (leaving enough to hang out the edges of the pan) and coat with nonstick spray; set aside. Make the syrup. 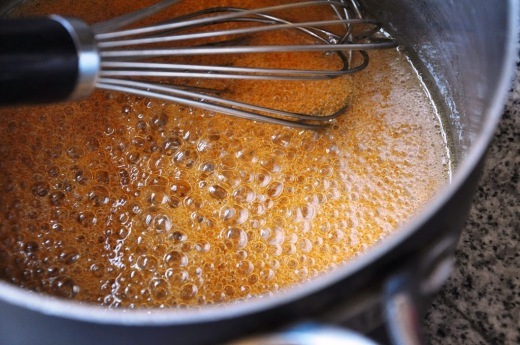 In a medium sauce pan, bring the honey, brown sugar and salt to a simmer; cook for 5 minutes (actually time it). 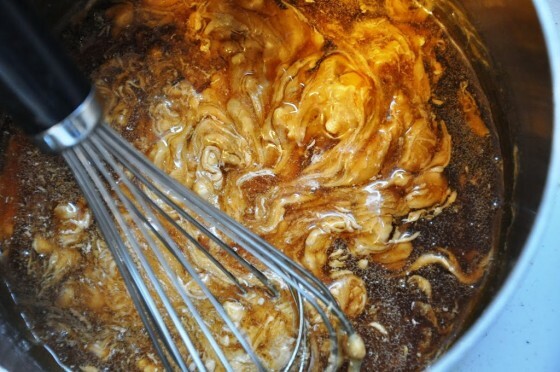 Remove from the heat and whisk in the coconut oil and peanut butter until smooth. 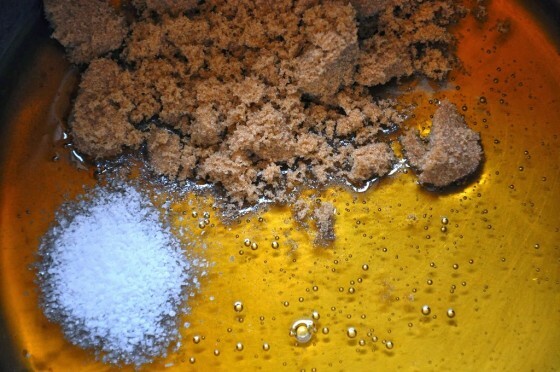 Pour the syrup over the dry ingredients and toss with a rubber spatula until all is evenly coated. Dump into the prepared pan and press the mixture firmly and evenly. Bake the bars. Bake for 25 minutes, rotating the pan after 15 minutes. Remove from the oven and allow to cool for 10 minutes in the pan, then lift the bars out of the pan with the parchment paper on to a cutting board. Cut into 16-20 bars and allow to cool completely. Once cool, the bars can be kept in an airtight container for up to 5 days (before they get a little stale, still yummy though!). I’m making them right now! can’t wait! I did it with dried cherries and blueberries, and then sunflower seeds and pistachios for the nuts. The syrup is sooo delicious I def licked the spoon and can think of a million other things I want to put it on :) thanks, you rock!